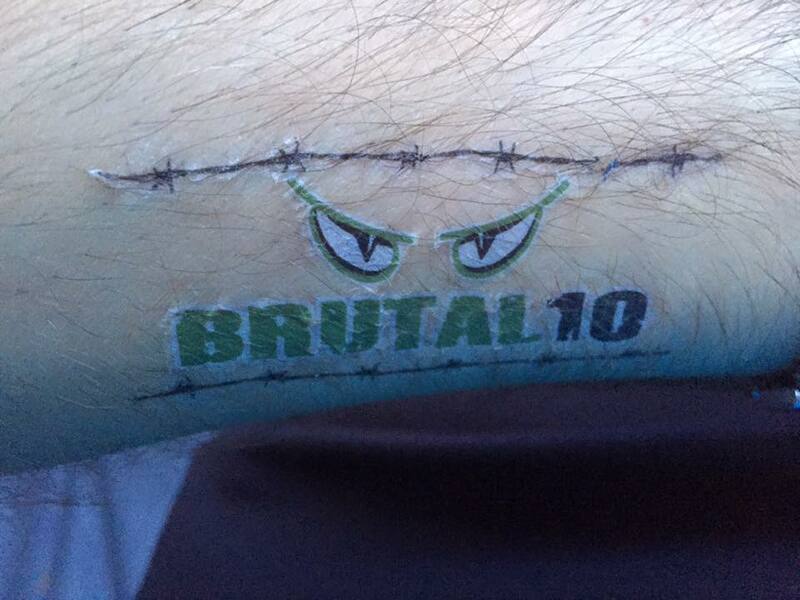 On Saturday night/Sunday morning, Stuart and I took part in the Brutal 10 Enduro, which was held at Minley (near Yateley). It was a 12-hour running event starting at 9pm. Stu decided to enter as a pair with his friend, Rob. I entered as a pair with Rob’s wife Kim. Stu and I have done similar events to Brutal 10 before (although always in much larger groups), so we felt quite well-prepared. However, we had no idea just how tough the cross-country course would be. There were lots of sharp ascents and descents, with a variety of terrain underfoot – the one I hated most was the cushiony layers of pine needles that were inches deep. They provided a soft landing for people who fell but really sapped your energy. We arrived at 5pm and decided to set up our tent. There wouldn’t be a lot of time for sleeping but wanted to have somewhere to shelter whilst our partners were out on the course, as well as a private changing area. We chose an area that wasn’t too far from the start/finish but was also at the 5k point in the race. There were no other tents nearby, which also meant it was quite quiet. There were some fun touches at the event, including some temporary tattoos. By 7pm, we had registered and collected our timing chip/radio transmitter, race numbers and free technical t-shirts. We then realised that we had nothing to do for a couple of hours… but as it started to rain heavily and there were a few peals of thunder we decided to just sit in the tent and chat. Stu, Kim and Rob chilling out! 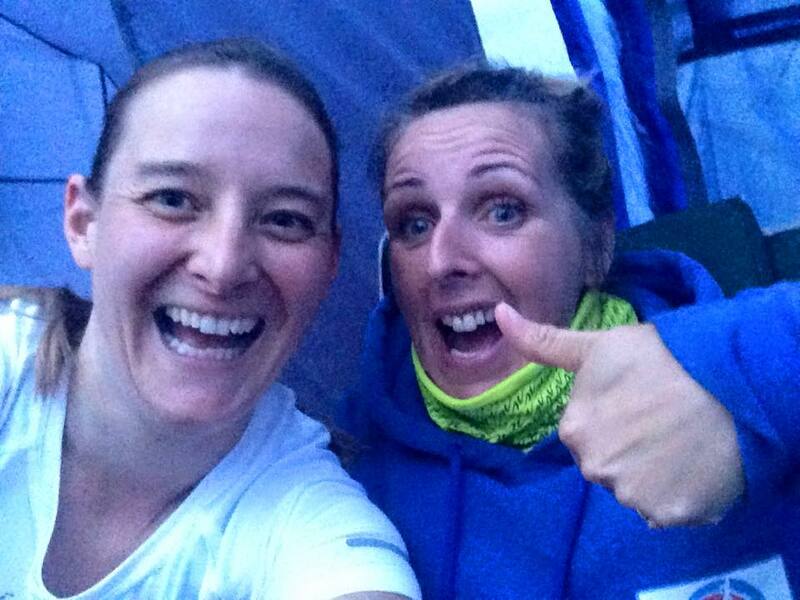 By 8:45pm, the rain had died away, so it was time to go to the start of Brutal 10. 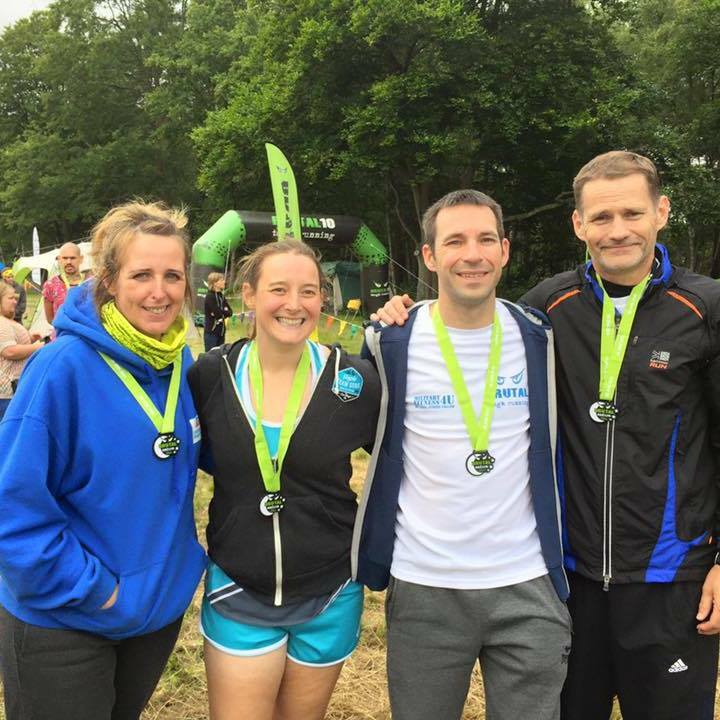 Various events were taking place at approximately the same time: a single lap 10k race; solo runners, pairs and teams of 4 and a cani-cross event. The cani-cross runners were set off first and then about 10 minutes later, we started. I was the first runner in my pair and had the luxury of daylight for half of the lap. I had decided to pace myself and was glad that I did. Although the first half of the lap wasn’t too bad, the second half was very technical. I knew that it would be challenging later when it was completely dark. I finished my first lap in about 1:05 and handed over the radio transmitter to Kim. We then alternated until each of us had done three laps, by which point Kim was unable to continue. 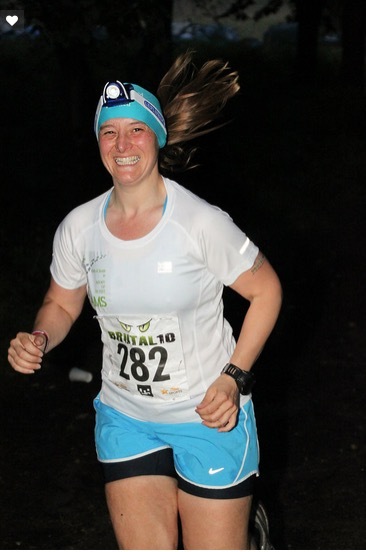 My first and second laps were uneventful, but my headtorch battery died 2km into my third lap. This threw me into a panic as I knew that I would not be able to do another 8km in the dark. Fortunately, I caught up with a female runner I had chatted with earlier and managed to follow her until I got to a bit of the course that I felt I knew well. 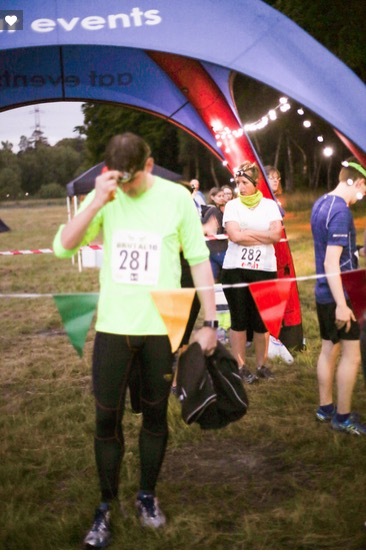 At 5km, I left the course, went into my tent, picked up some spare batteries and then rejoined where I had left. It was such a relief to be able to see again. 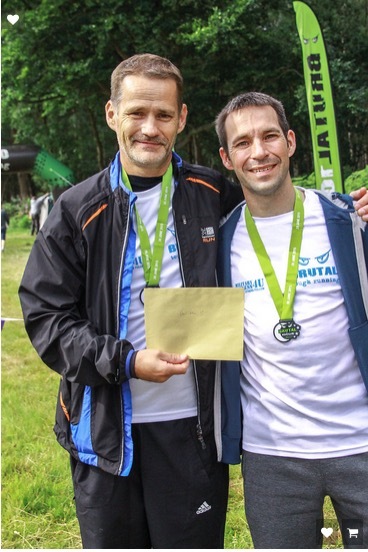 When I finished my lap, printed results had been displayed on a noticeboard and I could see that Stu and his partner had already built up a sizeable lead. 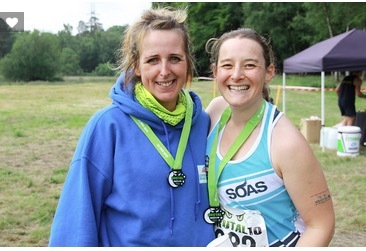 The first placed female pair had completed 6 laps when Kim was out running our 6th lap, but I could only see us as being down for completing two laps. This was a bit of a concern, but I didn’t have enough time to follow it up before Kim arrived at the changeover point. One of the challenging parts of this event was the weather conditions. Although it did not rain during the race, it was incredibly humid. I saw many runners wearing long tights, base layers and jackets, whereas I just wore vests and shorts and felt over-dressed in those. For this reason, the two laps I did that were fully in the dark were my favourite. They were marginally cooler than the others. My legs were starting to feel tired when I started my 4th lap (probably because I’ve not run over 13 miles since Southampton Half Marathon). I decided to give it my best shot and managed to pass a few runners (soloists, I’m assuming). Someone could be heard coming up behind me quite quickly at about 2k. I stepped aside, but he was further back than I realised so I continued on. Although the runner sounded like he was gaining on me, it spurred me to keep pushing myself. I managed to complete a fairly quick lap. (*Fairly quick for me = about 75 minutes). I had a small cup of energy drink and then headed out for a consecutive lap, at about 7:15am. 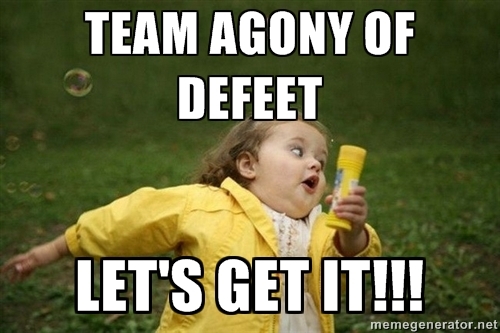 It all seemed to be going well until 2km in when I realised that I was feeling very dizzy and faint. I think this was because I hadn’t eaten more than an energy bar since 4pm the previous day and had only slept for 20 minutes. Sleep deprivation always affects me badly and I started to hallucinate a little, which is an unpleasant experience. 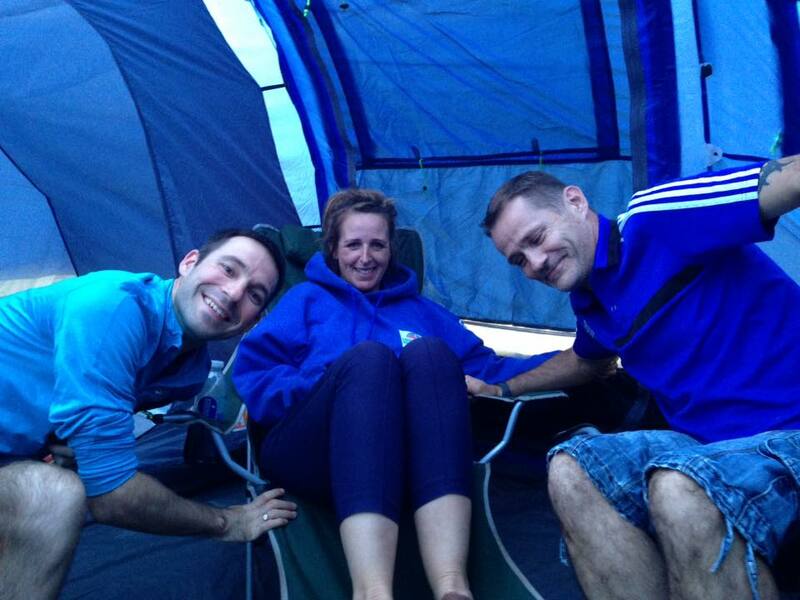 I realised that I needed to eat something, so at 5km, I called out to Rob, Kim and Stu, but no-one was in our tent. This meant that I had to leave the course again. I rummaged in the tent until I found a piece of flapjack. I then rejoined the course and walked for a while before I started to feel much steadier. 1 hour 45 minutes should have been plenty of time for me to run 10km. As I had wasted a lot of time, I knew I had to start picking up the pace. If I missed the 9am cut off, my final lap would not count. By 7km I was feeling much better and managed to start jogging. Eventually, I finished at 8:42am, so I made the cut-off. I’ve never run 50km within 12 hours before, so I felt quite proud of my achievement. At 9:15am, prizes for the event were given out. I was astonished to find that the female pair who had been in 1st place had stopped after 6 laps. This meant we had moved into first place, which was a great finish to a really fun event for me. 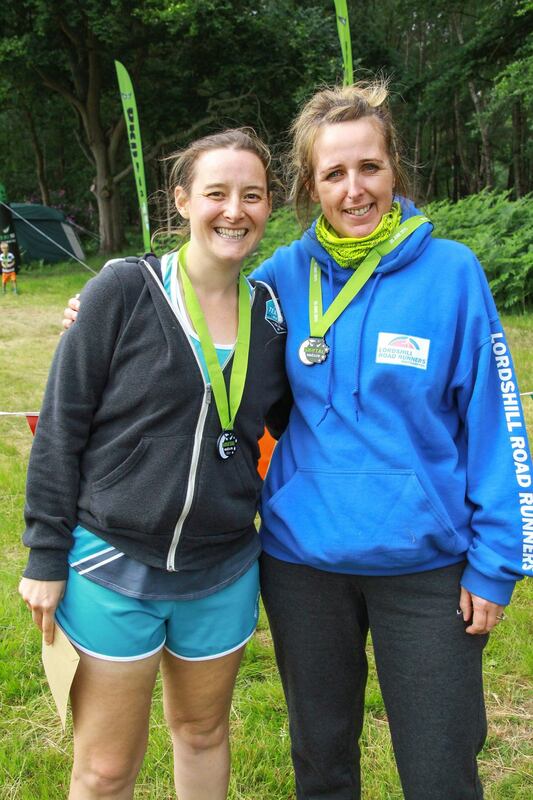 Brutal Enduro first placed female pair – if only we’d known that we were already in the lead after 6 laps! Great accomplishment! And what a pleasant surprise to be a winner! Well done. Thank you – I’m excited about buying some new trainers with my winnings, but I’m also tempted to buy something that will last longer as I cna’t imagine I’ll win anything else again! Trainers are good! Every time you put them on you will remember your success, how motivating will that be?! That’s true. I can’t get to the right shop for a couple of weeks, but I’ll start having a look at what I could get.